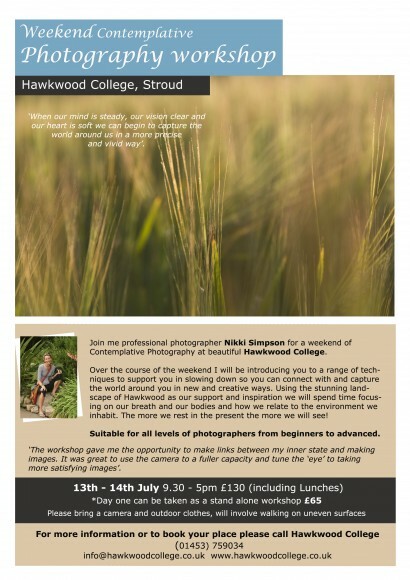 Join me for a weekend of Contemplative Photography at beautiful Hawkwood College in Stroud – July 13th and 14th*. Over the course of the weekend I will be introducing you to a range of techniques to support you in slowing down so you can connect with and capture the world around you in new and creative ways. Using the stunning landscape of Hawkwood as our support and inspiration we will spend time focusing on our breath and our bodies and how we relate to the environment we inhabit. The more we rest in the present the more we will see! Suitable for all levels of photographers from beginners to advanced. Please see the flyer for booking info. This entry was posted in Uncategorized by phibelle. Bookmark the permalink.